The LRT 1090-2.1 boom crane blends safety with innovation. German crane manufacturer Liebherr has re-entered the rough-terrain market. Impressed by the line’s capabilities and safety features, the ALL Family of Companies has pre-ordered 15 machines. The LRT 1090-2.1 is a 100-USt full power boom crane, set to debut at the 2017 CONEXPO-CON/AGG show (March 7–11, Las Vegas). The LRT 1090-2.1 blends safety with innovation. The manufacturer’s VarioBase outrigger monitoring system enables each support to be extended to a different length while automatically delivering support status information to the operator. It’s ideal for maintaining safety and flexibility in the tight spaces encountered in today’s urban and industrial jobsites. It also allows for capacity when lifting over the supports. The boom crane incorporates safety features into a modern package. The flat deck, electrically extendable cab platform, and multiple ladders minimize the risk of fall injuries. Controls are easy to understand. The attachment of the counterweight and installation of the jib are fully monitored by the boom crane during setup. 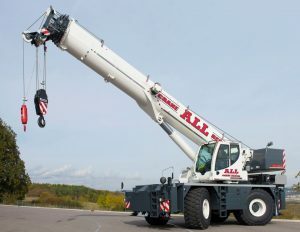 The ALL Family of Companies has strengthened its all-terrain crane fleet with the addition of five Liebherr ATs. The ALL Family of Companies has strengthened its all-terrain crane fleet with the addition of five Liebherr ATs, all featuring an innovative crane support system. The Liebherr ATs, with a wide range of boom lengths and lifting capacities, will be diverted to locations where demand is heaviest, but will generally serve customers in Cleveland, the Carolinas, branches serving the northern part of the U.S., and ALL locations in Canada. Two 70-USt LTM 1060-3.1: one will be shared among the Central Rent-A-Crane (Indiana) branches, Central Contractors Service branches (Illinois), and ALL Canada Crane locations, and the second will go into the general company fleet. One 65-USt LTM 1055-3.2, going to ALL Carolina Crane. One 240-USt LTM 1200-5.1, going to ALL Carolina Crane. One 265-USt LTM 1220-5.2, going to the main yard in Cleveland. These ATs are a part of a line of Liebherrs that include the VarioBase variable supporting base system. VarioBase allows the operator to customize the crane’s outrigger extensions to best take advantage of the available working space, which in turn helps enhance lifting capacity and flexibility on the job site while creating greater efficiency. In tight spaces or on narrow sites, it can be challenging to extend all the outriggers as far as necessary for proper and safe lifting. With VarioBase, each support can be extended to whatever custom length is needed to fit the site. Then the load moment limiter within the crane’s LICCON control system ensures that the unit can operate and hoist loads safely. According to Liebherr, VarioBase calculates the precise lifting capacity for any support base and then monitors the crane’s stability, which helps increase the safe working range, as well as the lifting capacity. The work planner in the LICCON system also allows jobs to be planned and simulated in advance if desired.